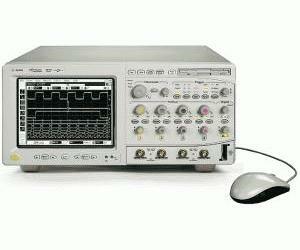 The Agilent 54831D 4+16-Channel 600 MHz Mixed-Signal Oscilloscope (MSO), with 4 scope channels and 16 timing channels, uniquely combines the detailed signal analysis of a scope with the multi-channel timing measurements and triggering of a logic analyzer. Digital and analog events are aligned in time so you can easily relate cause and effect in difficult mixed-signal, digital and analog troubleshooting situations. Now with the N5397A FPGA Dynamic Probe, the 16 logic channels can be used to look inside your FPGA. The 54831D also incorporates Agilent´s innovative MegaZoom technology,now available up to an unprecedented 128 Mpts, that provides fast waveform update rates and instant response, even with the deepest memory being acquired. Mixed-signal triggering provides a complete set of triggering features across all 16 timing channels and 4 scope channels.